The meerkat (Suricata suricatta) is a companionable mammal that usually is grayish or beige in basic coloration. These slim and tiny mongoose relatives are highly social animals, and because of that spend the bulk of their time in units that frequently consist of upwards of 30 fellow meerkats. These units are referred to as "mobs." Meerkats typically weigh slightly less than 2 pounds, and are usually roughly 11 inches long, according to Zoo Atlanta. In the majority of cases, male meerkats are just a tad smaller than the girls. Not only are meerkats' general physiques lithe, their limbs are as well. Meerkats eat mostly bugs, but feed on other things too, including plants, larvae of butterflies and beetles, snails, eggs, spiders, birds, scorpions and wee reptiles. Since they are diurnal, they go about most of their activities when it's light outside, whether grooming or seeking sustenance. Meerkats can be found in the southern region of Africa, particular in its western portions. They inhabit countries such as South Africa, Mozambique, Zimbabwe, Botswana, Namibia, Lesotho and Angola. 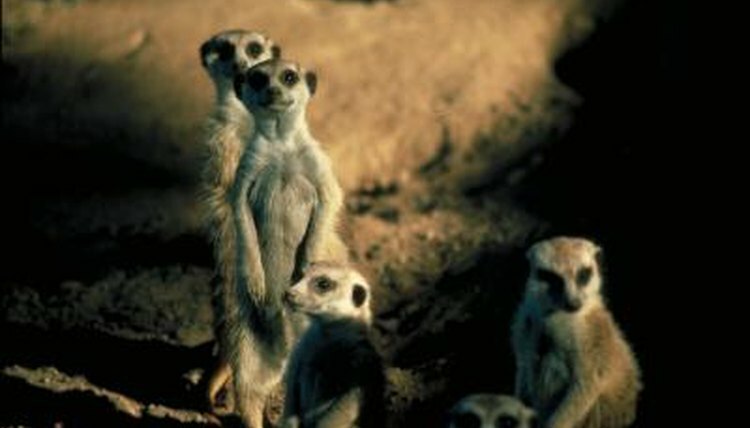 The meerkat population is healthy, and as a species, they have no imminent risks of endangerment, according to the 2008 evaluation by the International Union for Conservation of Nature Red List of Threatened Species. Meerkats reside in several different types of habitats, such as scrub forest, grasslands, semi-desert, plains and savannas. They gravitate toward arid and dry areas -- especially those with rugged, rocky or sandy terrains. For the most part, meerkats stay far away from mountains. Meerkats can manage just fine in daytime temperatures of more than 100 degrees Fahrenheit. Meerkats are highly skilled at digging, but don't usually take advantage of that, because they tend to take up residence in burrows that were previously carved out by other creatures -- think yellow mongooses and African ground squirrels, for example. Occasionally, however, they dig out burrows for themselves. They sometimes even set up house in termite mounds that are no longer in use. Meerkat burrows are pretty sizable, and sometimes can have a maximum of 90 separate entry points. They are also occasionally even multi-tiered, with depths of upwards of 10 feet.